1920, and some of the poet's most enduring poems were written here. Since 1977 a contemporary poet has been awarded a residency each summer. 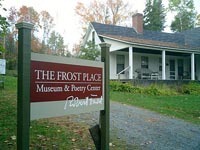 The Frost Place re-opens Memorial Day weekend.